Directed by Karel Reisz. 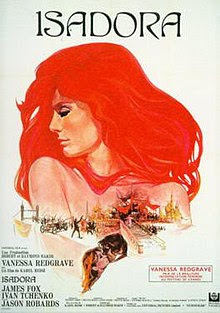 Biographical film on the story of Isadora Duncan, starring Vanessa Redgrave, James Fox and Jason Robards. Screenplay adapted from the books My Life by Isadora, and Isadora, an Intimate Portrait by Sewell Stokes.